The modern design of a Glasbeek box oven manages to combine modest energy consumption with outstanding performance. 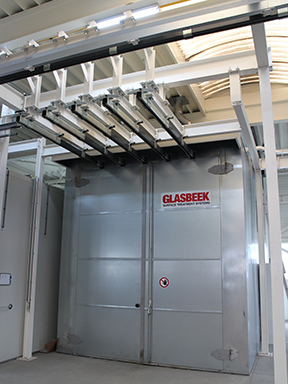 Glasbeek ovens are suitable for drying, curing, ageing and homogenizing metals, plastics and composites. Advanced technology means that the user is freed from concerns about reliability, functionality or maintenance. You can specify a wide range of options for your box oven so that it can be fully customized and integrated into your production process. It is possible to reduce consumption of fuel and electricity without sacrificing the efficiency and quality of production processes carried out on your materials. 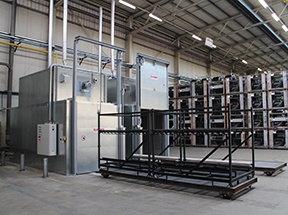 Every durable box oven constructed by Glasbeek is adapted and tailored to your product and production process needs. Gas, oil, electric, LPG or diesel fired heating options are available with a maximum temperature of 500°C. The well-equipped Glasbeek box oven is insulated with rock wool and available with rotating, sliding or lifting doors. It can also be easily expanded with carefully chosen options in order to adapt the installation even better to your personal requirements. Every durable Glasbeek box oven is the product of more than 100 years of experience and development. During manufacture only the very best materials are used to guarantee a long working life and minimal maintenance. Outstanding heat transfer is achieved by the use of a durable high-efficiency Glasbeek heat exchanger constructed from high-grade, heat-resistant materials with a large heated surface. Powerful microprocessors continuously control and monitor the combustion process to ensure maximum efficiency. All burners are fully automatic and offer easy operation and maintenance. The ventilator engine drive system is equipped with an integrated frequency converter to control the adjustable air velocity. The evenly distributed ducts in the oven allow for direct airflow to the products and a uniform temperature distribution in the oven. The comfort control allows for automatic startup and cooling down of the oven and fans. A fail-safe thermostat protects the oven against excessive temperatures. We supply appropriate solutions for each oven system that save energy and fuel. Advanced oven technology can be monitored on the touchscreen, with control and registration features included in a clear PLC menu. Remote assistance using an Internet connection is fast and user friendly.